Gardening might be a fun hobby for some, but for many others it's much of a hassle to deal with. In this article I am writing a simple guide on how to build a smart IoT plant that would send sensor data to Azure IoT Hub and storing over Azure SQL via Azure functions, at the same time both auto and remotely control water for the plant. 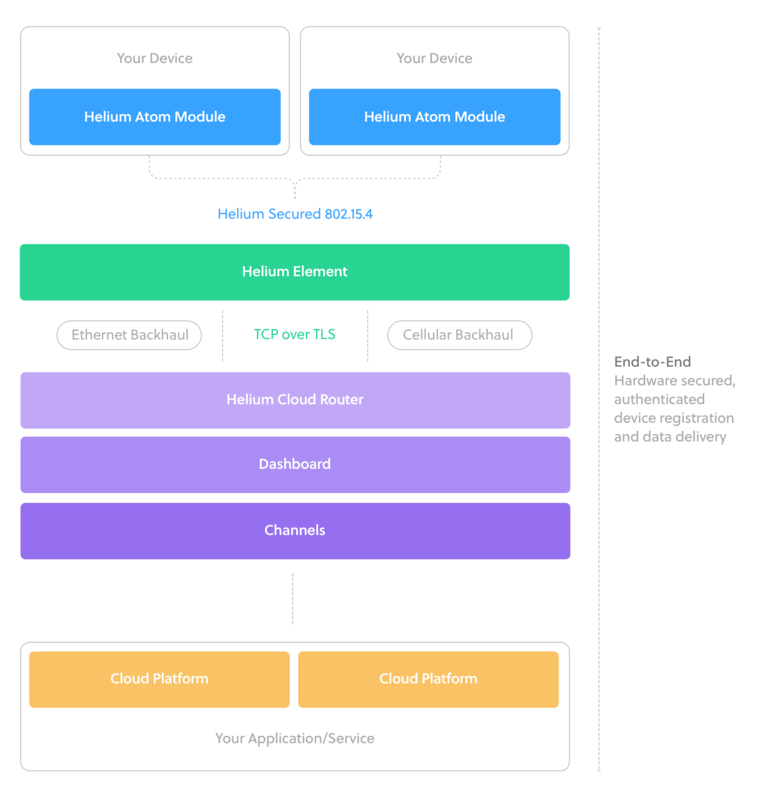 Helium IoT Hub connects to Azure IoT Hub in a seamless fashion, in this article we will explain how the entire process works. Since the entire project is serverless, the only code needed for the entire process to work is just Azure Function and Arduino code. In this article we will focus on using Arduino as our app, the first thing is that we will be pushing data from Helium Atom to Helium Hub. We first have to register our Atom on Helium Network Dashboard. After setting up the Atom we'd also have to register Element as they are the access point, (for those who has cellular version powering it up would do). After activating element we should see it on Access Point. Next, we need to attach all the sensor as well as the Helium Atom, when it's all done it should look something like this, a bit messy but we can clean that up later. We can run the following code to know that the program is running. #define CHANNEL_NAME "Azure IoT App"
The water pump requires 12V, while normal Arduino would only output 5V max, so in order to get the lock to work we can tap into the power source by soldering two wires at the power source like image below. We will use red wire as 12V and black wire as ground. The relay will act as a control to whether when the water will be pumped in. We first create IoT Hub under all services, it would be wise to move IoT Hub into favorite so it would be accessed much more easier. We can use standard tier since the Free Trial $200 trial credit can cover it. You can also choose to use the Free Tier as well. After selection the name you can move to Size and Scale. After getting that primary connection string, go to Helium Dashboard and create a Helium Connection, after pasting the connection string into the connection field, everything else should be automatically filled. After setting this up, we would be able to get all the MQTT strings being automatically generated in Helium Hub. This can be easily accessed through the channel. Since Azure requires device to publish and subscribe to a fixed MQTT topic, this will allow Helium Atom to do that as well as letting IoT Hub to push messages to Helium Atom. We can do following to test out the sending to Azure. ./helium -p /dev/serial0 channel create "Azure IoT App"
./helium -p /dev/serial0 channel send 1 "Hello Azure"
Device is authenticated through X509, and Helium platform handles all of it. Making it simple and clean. Next we need to be able to store the data coming from IoT device. There is a great guide about this written in detail on https://blogs.msdn.microsoft.com/sqlserverstorageengine/2018/01/23/working-with-azure-iot-data-in-azure-sql-database/ In this article we will focus on quick integration of how that happens. We first go to SQL databases to create a database as image below, we can select Basic Tier as we are only starting the app, the free trial credit should be able to cover it. This is the cheapest option for prototyping, as you scale, you might want to move to Azure Cosmos in the future since the minimum on Cosmos is $25. Now we have a table to store the data to, we need to connect this to an eventhub so that data can be stored in. Go to Connection Strings and grab the connection string for the next step. In order to connect to function we will use Event Hub. We first need to create an Azure Function App, which allows serverless structure, which is great for IoT applications since we no longer have to maintain. To start we first need to create a function App under compute. Just take about a couple of minutes and we will have it under our notifications. Next step is create a Event Hub function, for this example we will use C#. After clicking new connection things should be auto populated. Change the Function to following, this is to to insert data directly into Azure SQL Database. At this point we have the entire end to end data sending from Helium to Azure SQL via Azure IoT Hub. Next we need to retrieve the data, which we need to create an HTTP Trigger via Azure Function API. This would test out the result and return "hello foobar". When this is finished, we can use following code to return the actual data. Next we can use following code to test out the entire app. This is the simplest query, which additional information can be gathered by writing more complex queries, but for prototype we will just focus on getting one record. When all done, it should yield result for the latest record. On the other side the Arduino enclosure can be closed so it would have a much better view next to the plant. We can easily simulate it's own pumping.